Darling Harbour is a must do for any visit to Sydney. Popular with tourists, this area of Sydney offers a range of activities and attractions all within walking distance to many Darling Harbour accommodation options. The International Convention Centre is close and just a short walk away is Chinatown, The Sydney Entertainment Centre and the immaculate Chinese Gardens of Friendship. 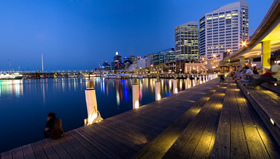 There is an abundance of cafes and restaurants surrounding Darling Harbour accommodation at Cockle Bay Wharf, King Street Wharf and even stretching up to the new Barangaoo development, where you can sit waterfront and watch the boats leave the harbour. Take the kids for a day out to the SEA LIFE Sydney Aquarium and pop into the WILD LIFE Sydney Zoo that is next door. For those interested in all things Maritime, you can visit the permanent galleries of the Australian National Maritime Museum for free! There is so much on offer and Darling Harbour accommodation doesn't disappoint. There are affordable and comfortable apartments with full kitchens ideal for families as well as 5 star full-service hotel rooms that are great for business travellers who wish to be close to Sydney CBD. From your Darling Harbour accommodation, you can depart on a Harbour Cruise or if you're after shopping, the Harbourside Shopping Centre is full of great shops and souvenirs. And if you haven't shopped until your hearts' content, the historic Queen Victoria Building and Pitt Street Mall are just a few blocks from Darling Harbour.